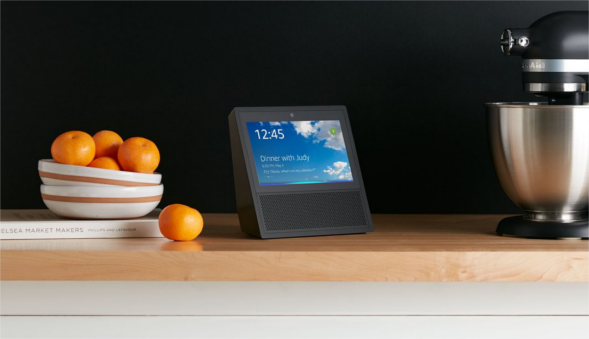 Amazon is launching Echo Show, a new Alexa-powered smart speaker that includes a 7in touchscreen and video-calling features, as it enters the next stage in an ongoing battle with Google to become the most popular in-home voice assistant. Echo Show, which will cost $230 in the US and will ship on 28 June (no UK release date is set), will operate like Amazon’s existing Echo and Echo Dot wifi-connected smart speakers, putting the company’s artificially intelligent voice assistant Alexa into the home. But unlike Amazon’s previous voice-only smart speakers, it will also have a touchscreen to show extra information, play videos from YouTube and elsewhere, show results for questions and other visual information that’s currently displayed when Alexa is asked a question on the firm’s Fire TV smart devices. The Echo Show is the second new Amazon Echo device to be announced in the last few weeks. In April, Amazon launched the Echo Look, a voice-controlled smart selfie camera that is able to compare outfits and give fashion advice. While Echo Look is only available to select customers in the US via invitation, Echo Show will see wider availability, albeit only in the US initially. Amazon is locked in battle with Google and others for the burgeoning new world of voice assistant-powered smart speakers. Amazon has the lead thanks to its original Echo, which was launched in the US in 2014 and the UK in 2016. It became a sleeper hit in the US, while its open partnerships with various smart home makers including Alphabet’s Nest and Samsung’s SmartThings propelled it to an early market majority. According to data from eMarketer, Amazon’s Echo devices will have 70.6% of the market versus 23.8% for Google’s Home. The research firm expects 35.6 million Americans will use a voice-assisted device at least once a month, which means that smart speakers will be far from a mass-market device, but usage will be up 128.9% year on year. Samsung’s Harman Kardon is set to release a voice-controlled speaker with Microsoft’s Cortana virtual assistant in the Autumn in the US, leaving Apple as the last of the big four US technology companies with a virtual assistant but no voice-controlled speakers to house it in. While Google’s Assistant has been available in a broad range of Android devices, including smartphones and smartwatches, Amazon’s big advantage has been the opening up of its Alexa system to third-party developers and hardware makers, which has seen Alexa appear in various speakers, other devices and cars. Whether an Echo speaker with a screen is what the next stage of voice-control in the home looks like remains to be seen. Apple’s senior vice-president of worldwide marketing, Phil Schiller, recently said in an interview with NDTV that a screen was key to a voice-controlled device, although the popularity of Amazon’s original Echo was partly fuelled by it being a voice-only interface that freed both hands and eyes.